Abstract: This article should help if you are having trouble installing Delphi 2007 Update 2 because your cache is not present. 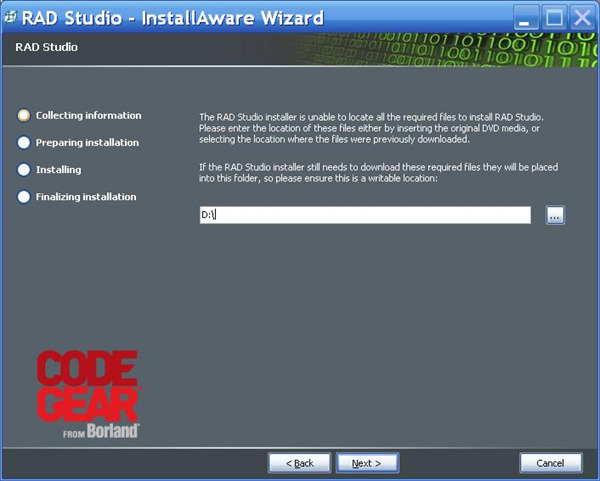 You obtain RAD Studio (C++Builder 2007, Delphi 2007) Update 2 and try to installed it. The installer displays the following dialog, and it cannot proceed even if you specify the folder of the install image on the DVD. 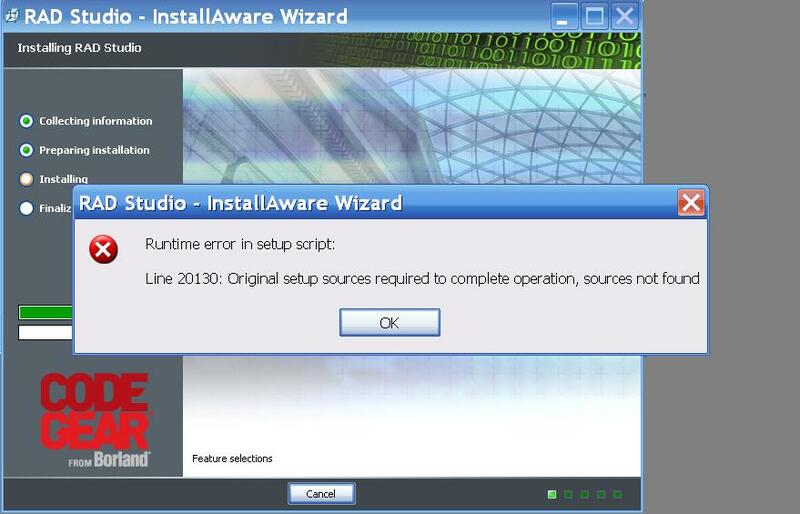 Then when you select Cancel, the installer displays the following error and exits. You try again to install Update 2. This time, the update mechanism says that no update is available, and it cannot apply the update. What can you do to resolve this? This problem occurs if you chose the option “remove installer cache” when you first installed the product. 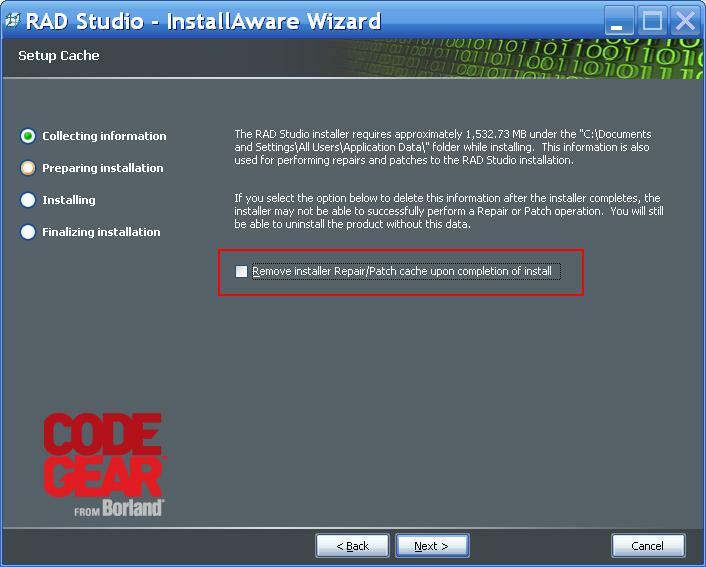 The Update mechanism requires the cache; you cannot apply an Update if there is no installer cache. For all configurations, first follow these steps to back up the registry. Then there are different steps to follow, depending on your current configuration. To ensure the preservation of your 3rd party components and custom IDE settings, back up the registry using the following steps. From the Start menu, Run Regedit. 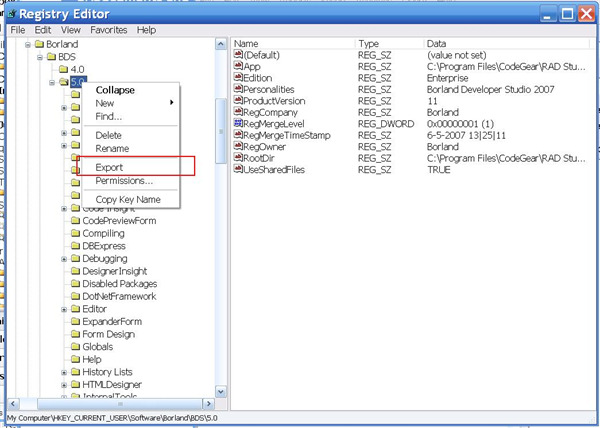 Right-click on 5.0 and select Export. 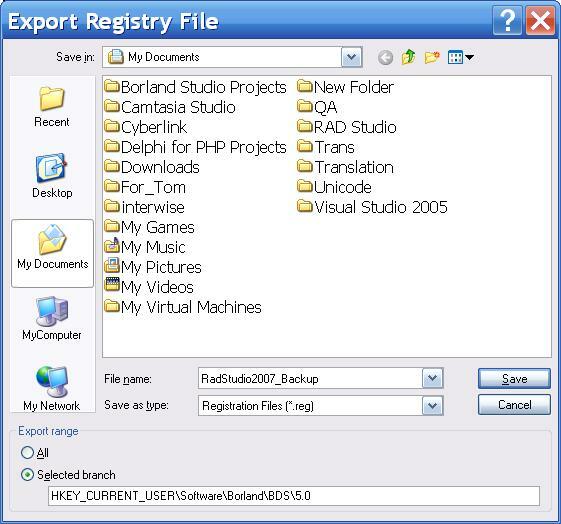 Select the path and name to save the registry information; for example, C:\Backup\BDS2007.reg. After completing the Repair procedure described later in this document, double-click on the .reg file to merge the previous settings. If you have a DVD, put it in the drive. From the Start menu, select CodeGear RAD Studio [ Modify, Repair, Uninstall. 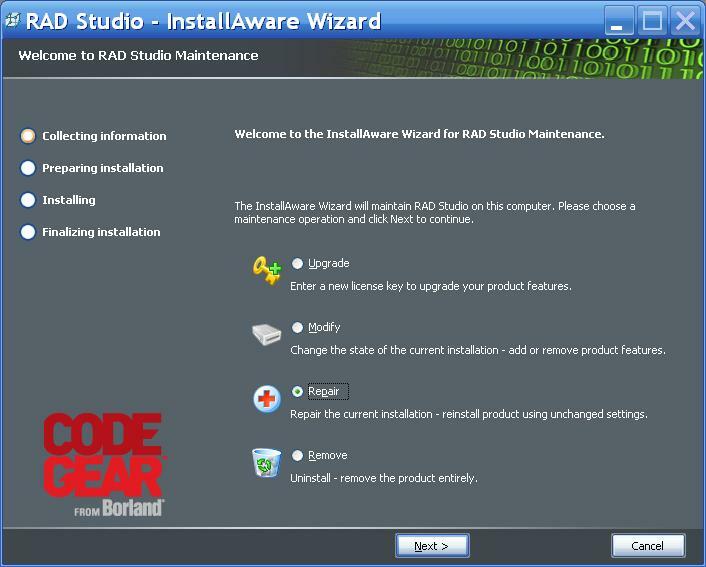 In the Maintenance wizard, select Repair. The wizard will ask for the location of the installation media. For DVD customers, browse to the DVD drive. For ESD customers, look online. DO NOT SELECT the option “Remove installer Repair/Patch cache”. Go to the CodeGear registered users download site and download C++Builder 2007 Update 2. Run the setup to apply Update 2. Check the Part Number of your DVD. Make sure it ends with “190”; for example, HDB0007WW15190. Otherwise, see the next section of this document. Go to the CodeGear registered users download site and download Delphi 2007 for Win32 Update 1. In the Maintenance wizard select Repair. Go to the CodeGear registered user downloads site and download Delphi 2007 for Win32 Update 2. Run setup to apply Update 2. If you have a Delphi DVD, check the Part Number. Make sure it ends with “191”; for example, HDB0007WW15191. Go to the CodeGear registered user downloads site and download the setup file for Update 2. 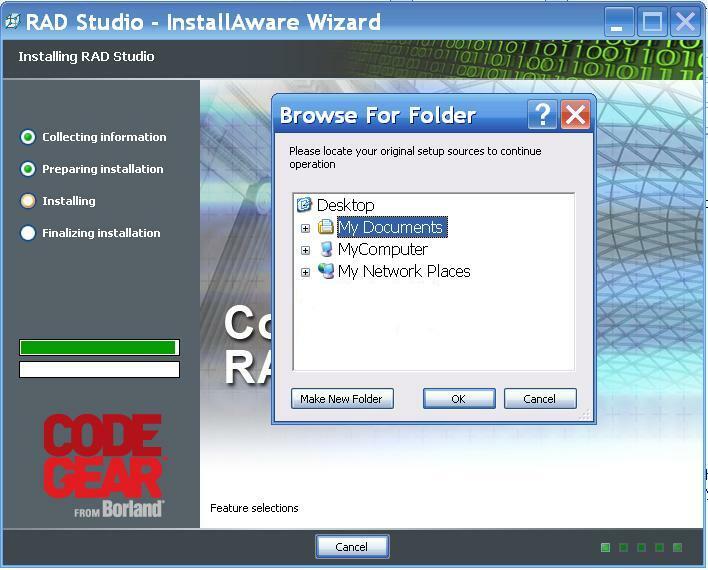 Go to the CodeGear registered users downloads site and download C++Builder 2007 Update 2.